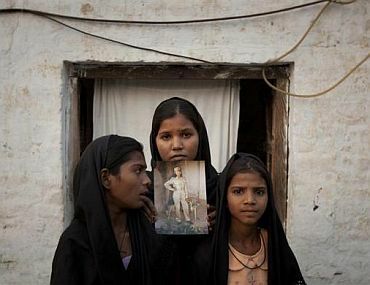 The daughters of Pakistani Christian woman Asia Bibi pose with an image of their mother while standing outside their residence in Sheikhupura located in Pakistan's Punjab Province. Asia Bibi, a Christian mother of four, has been sentenced to death for blasphemy -- the first such conviction of a woman, Pakistan's Dawn newspaper reported. Standing left to right are Esha, 12, Sidra, 18 and Eshum, 10. 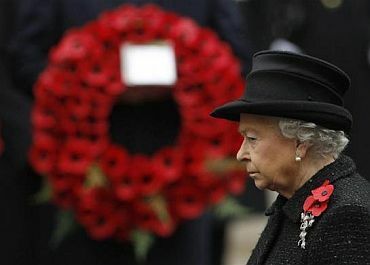 Queen Elizabeth attends the annual Remembrance Sunday ceremony at the Cenotaph in Whitehall, in central London. 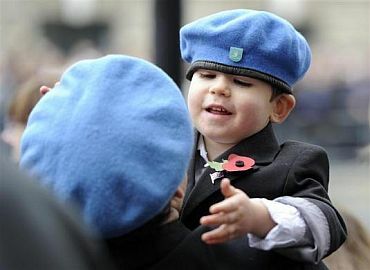 The day commemorates the contribution of British and Commonwealth military and civilian servicemen and women in the two World Wars and later conflicts.